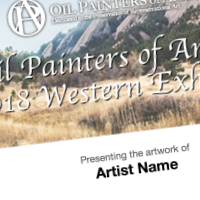 Congratulations on being accepted into this year’s Western Regional Exhibition to be held at Mary Williams Fine Arts, located in Boulder, Colorado, September 7 through October 6, 2018. Your painting is one of approximately 80 paintings to have been selected to be a part of this very special exhibition. Your painting should arrive between the dates of August 13 – 17. Local artists should drop off their work between August 20 – 24. Your painting should arrive at the gallery between the dates of October 23 and October 27. Please uncrate your artwork or use a commercial art crate when delivering to gallery in-person. Any artwork that is crated using a non-commercial art box will be charged an uncrating fee. b. Second, create your return shipping label and email it directly to the host gallery, Mary Williams Fine Arts . Be sure when you email your label that you include your name in the subject line. Example: “John Michael Carter – Return Shipping Label”.